What is Smurfing in CSGO? Is it Good or Bad? Smurfing has become a necessity in gaming nowadays, People purchase a lower rank than their main rank and try to stumble upon the opponents in a fancy way. It will be easy and at the same time much more enjoyable experience by winning against silver team. Smurfing includes a person to have two or more than two CSGO Accounts and they are known to be CSGO Smurfs themselves. Smurf account is a widely acquired strategy by Hackers/Noobs in order to increase their Rank and try to accomplish themselves as a Pro Player buying a high ranked account directly. People also try to avoid the hassle of Cool down Period or Abandoning the game after effects. The Players who use these Accounts are known as Smurfs. There are many Advantages and disadvantages, Smurfing Promotes cheating in csgo where a player can go full blatant and finish off the game in style, here the legit players suffer from a legit gameplay. The advantages include a legit player who has been trying to rank up but gets constantly deranked due to frequent internet disconnection or from getting kicked by teammates. Hence , Smurfing is actually good for players learning , but bad as people exploit it too much. 1. PRIVATE RANK 2 (PR2): Getting yourself to play death match or arms race mode to reach PR2 Status is a Compulsory measure by Valve. To avoid this hassle, you can purchase a Private Rank 2 Matchmaking Ready Account within seconds and starting playing with your teammates. However you need to get 10 wins on Private Rank 2 (PR2) Account in order to unlock the Matchmaking Rank! 2. Silvers: Silver CSGO Smurf Accounts are the lowest and the worst ranks in the game. Silvers don’t have any game sense or knowledge about the game and cannot even aim properly. That’s the reason many of the players opt to buy csgo Silver Smurfs as these accounts are the best for building confidence on yourself. 4. Master guardian: Master Guardians can say they have average skills in the game, if you observe the Guide - ranking charts, Master guardian has less players than Gold Nova which depicts that you are advancing towards the good levels! 5. Distinguished master guardian: If you are playing non-prime matchmaking you tend to matchup with hackers here or have an opponent as hacker. You might not feel this every now and then but it is still common nowadays! 6. Legendary Eagle & Legendary Eagle Master: When you reach here , you can for sure brag yourself as a pro player ! These ranks are cost effective because not everyone can reach here! 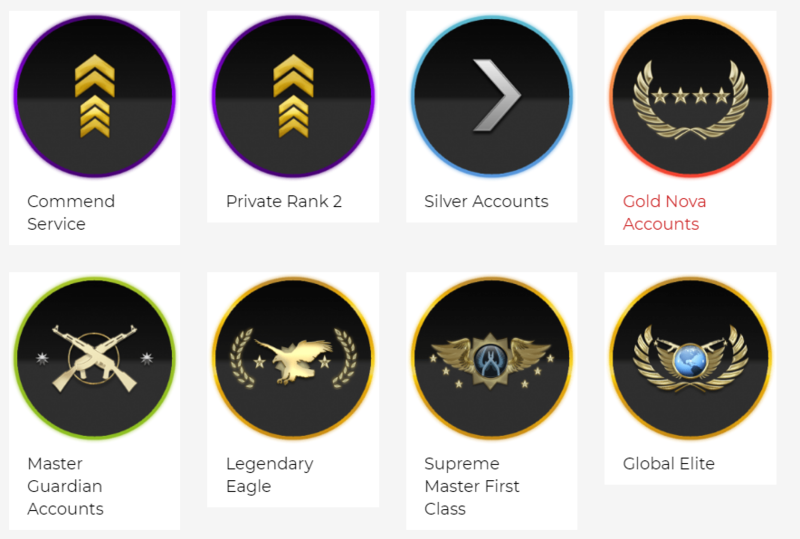 The further ranks like Supreme Master First Class (SMFC) & The Global Elite (GE) are extremely difficult to achieve and only 5% of the players manage to reach here. Since these ranks are quite tough , we use a Matchmaking fixing with the opponent trick , popularly known as the Vertigo Trick. Buy yourself a CSGO Smurf Account and enjoy variety of In-Game Services like Commends and much more. Head over to the CSGO Accounts Section now!